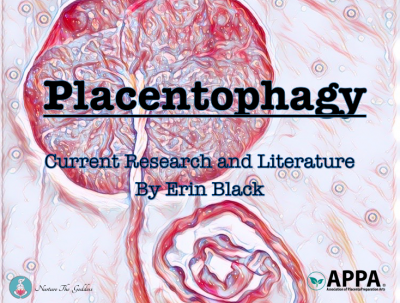 Placentophagy – A brief look at the history surrounding placenta consumption and a more in depth look at the research and literature available. During this presentation I extrapolate that consuming ones own placenta has the ability to positively impact and aid a Woman’s postpartum period referencing the studies conducted to date. *DISCLAIMER – It is really important to understand that placenta consumption is not a ‘cure all’. Placenta encapsulation should be just one tool in your postpartum recovery tool kit. If you feel your mood declining reach out for help immediately.